Don't wait until the last minute to run out for a store bought card for mom. Check out my post to order it online with a custom message and personalized photo. A year ago close to Mother's Day I posted about gift ideas which could be presented year-round. Since there are a variety of ideas you should check out that link to see what might be a good gift for your mom, grandmother, or a special woman in your life year-round. In this post, I sharing some great customizable Mother's Day cards. 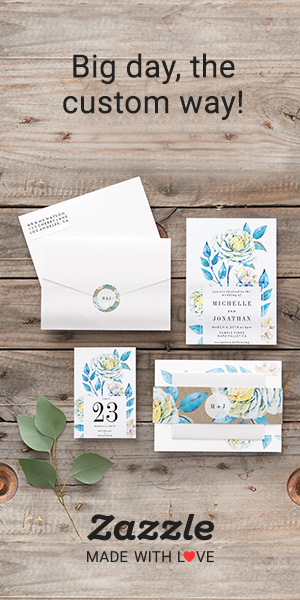 Zazzle sells a variety of stationery type items to include announcement cards, invitations, postcards, stationery and much more. All these items are offered with designs by creative designers like me who sell online and make it easy for you to personalize. This year I've been working on adding Mother's Day cards to my holiday categories. I only had a few older designs but these new creations allow you to really add a personal touch. Zazzle greeting cards are available in matte and glossy finishes. You can order in greeting card size 5" x 7" and 4" x 5.6" note card size. On each greeting card link, you will also notice that you can order with or without an envelope which will save you $.15. All the cards I share here have a glitter background since it's quite popular on a lot of things these days. These Mother's Day card designs are quite simple with the focus on customers personalizing them. You can change or remove the front and inside greeting right on the page. Each of these card designs offers a placeholder photograph that you easily replace with a cherished photograph mom will like. The placeholder photo option is listed at the bottom of the Personalize button. You'll see the option to Change the placeholder photo that is there. A square photo or a horizontal photograph with the subject(s) centered in it will work best. Test out several photos to see how each one looks before ordering. These Mother's Day glitter designs are offered in the store with a pink, purple and gold, coral, or purple/lavender background. This next card is similar to the above design but with a floral theme and a simple border. On this card, you can also replace the photograph with a cherished family image or leave the floral that is on it. This too is available in four total glitter background colors with color matching flower placeholder photographs. And if you might need something totally different, here's an idea. Some folks might want to spread the love to a pet owner. Not to worry because I designed several cards for a "fur momma" too. The cards below offer adorable animal placeholder photographs that you can change with mom's cherished pet or keep them just as they are. You also get to personalize the cover and inside text. Zazzle has thousands of Mother's Day card designs so you can cruise into the marketplace from one of the card designs here. Let me know your thoughts on the post and designs. If I can be of any help please leave a comment or contact me via TheAspenStand@hotmail.com.